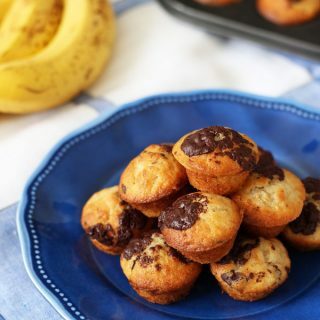 Mini banana muffins, made with a secret ingredient! 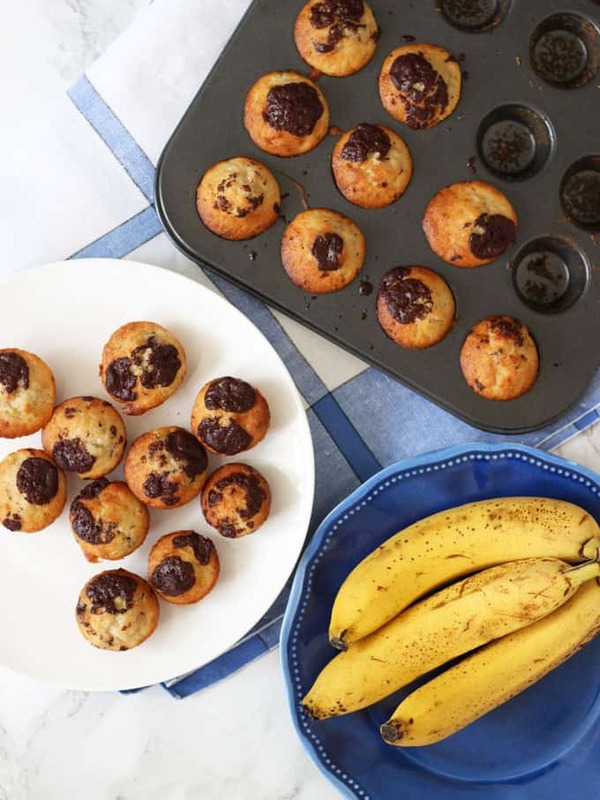 With no need to add oil or eggs, delicious, light, packed with chocolate chips, these little cakes make a super afternoon snack or breakfast treat. Over the last few months, I’ve made a big effort to get fit. For the first time in my life, I’ve found an exercise I love and, wonders will never cease, I am sticking to it. SAY WHAT? I’ve taken up Metafit, it’s this crazy kind of High Intensity Interval Training (HIIT) but the thing I love the most, is it’s over in 27 minutes and those 27 minutes of feeling like the world is going to end it’s so hard, leave me feeling amazing for days and days afterwards. I’m a total convert. Heinz have just launched their new [Seriously] Good Mayonnaise and yes, it is really, very good. 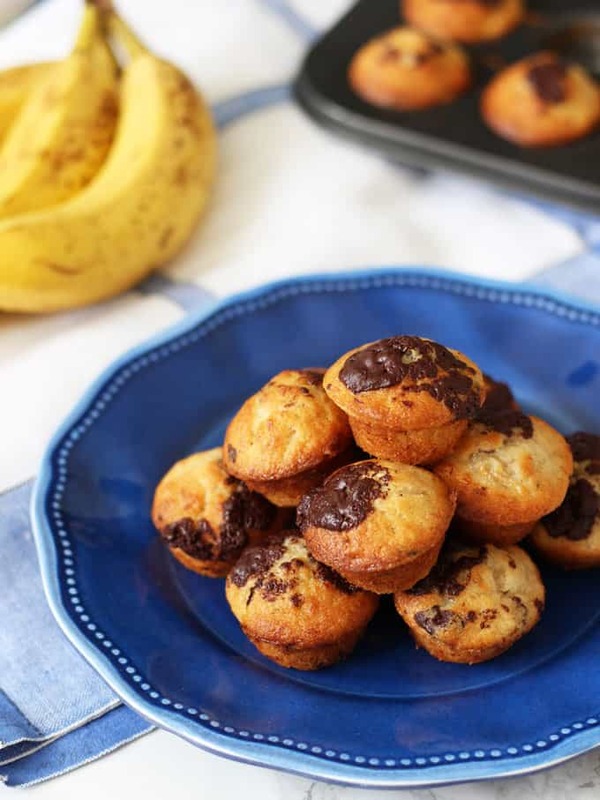 It’s the secret ingredient in these mini muffins and it gives them a really light texture. It also makes them a brilliant storecupboard standby bake. Always good for everso slightly disorganised bakers like me, who go to bake something and realise that they have no eggs to hand. Heinz are also running a competition to create a recipe using the [Seriously] Good Mayonnaise to create the most moreish mouthful. A miniature dish that will be judged on just one spoonful. Think you’ve got a recipe that could be in the running? Pop over to http://seriouslygoodspoonfuls.co.uk/ to enter. 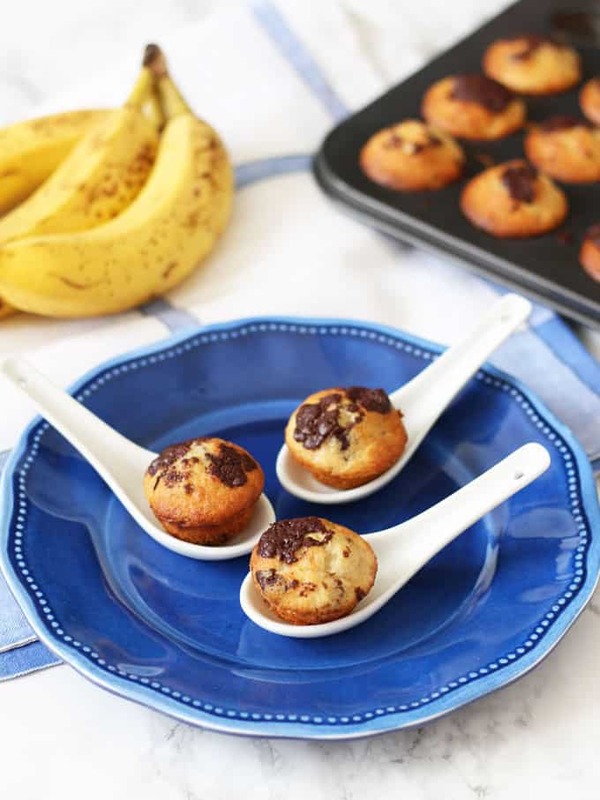 I bake using a Mini Muffin Pan like this one from Amazon, Non-Stick Mini Muffin Pan. I think these pans are a great investment as making miniature anything suddenly makes them prettier somehow? Make sure that you oil the tin well so that the muffins pop out easily. Please use Vanilla Extract NOT essence, it’s the real deal and you’ll notice the difference. This is the only brand I use (because it’s the best! ), you can buy it on Amazon here: Vanilla Extract. If using a food mixer, pop the peeled bananas in and blend until well mashed (otherwise, mash in a bowl using a fork). Add the vanilla extract and mayonnaise and mix well. Add the flour, sugar, baking powder and chocolate chips and mix until just combined. Grease a mini muffin pan and fill the muffin cavities about two thirds full. Bake for 12 - 14 minutes or until golden brown. Allow to cool for 5 minutes in the tin and the gently take out. Best served on the day they are made, or frozen. 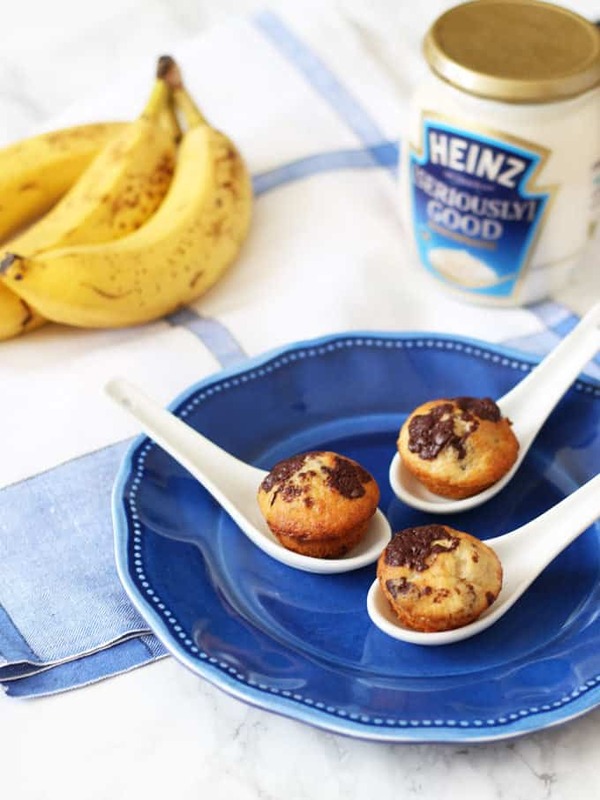 Pin the Mini Banana Muffin recipe for later..
Disclosure: This recipe was commissioned by Heinz. As always, all opinions are truthful and I wouldn’t endorse a product I didn’t genuinely think was brilliant. This looks delicious. I love bananas, I will definitely try to make it at home. Mayonnaise!!! I would have never guessed your secret ingredient indeed!